Bob Monkhouse has been a star in show business for over 40 years. During those years he has known both triumph and tragedy. These are his memoirs. His first son was born disabled with cerebral palsy; his first marriage fell apart painfully; he was arrested in 1978 for conspiracy to defraud, leading to a two-year struggle with the law that took him to the dock of the Old Bailey. But with these low points came the high - his first smash TV series in 1953; starring in the first "Carry On" film; topping the TV ratings with hit series; quite a few fondly remembered love affairs, before he happily married his long-time secretary, Jackie. Bob's career has brought him into touch with almost every major star in entertainment and he has anecdotes about the famous - Frank Sinatra, Joan Collins, Bob Hope, Peter Sellers, Dudley Moore, Tommy Cooper, Princess Anne and many more. A classic autobiography from one of Britain's most loved and most famous comedians. Known for his witty one-liners, Bob Monkhouse was a hilarious stand-up comedian, hugely popular game show host of programmes including Family Fortunes and The Golden Shot, and legendary chat show host of the eponymous Bob Monkhouse Show. 1. 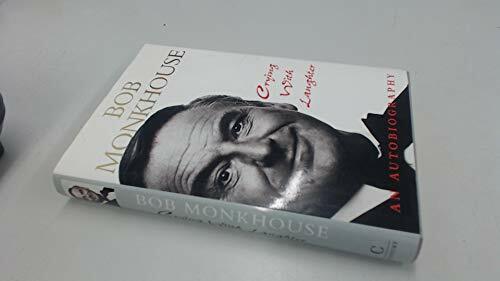 Crying with laughter [Hardcover] Monkhouse, Bob.